The first step in restoration of historical works is a technical analysis to determine the dyestuffs and structures. In other words, the chemical and physical properties of the dyes used in the piece are determined. This allows the method of restoration to be determined. One method which has gained in importance in recent years is to determine the dyestuffs in a piece, and use the same dyed with the same dyestuff in the area to be repaired. Although this is an extremely difficult method, we do employ it in our laboratory. 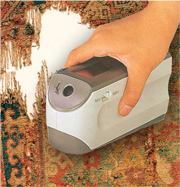 Example: Non-destructive chromatography performed on a historical carpet prior to restoration.